Thank you to all the volunteers that supported the 2014 Christmas Appeal. Here is our ‘thank you’ letter to all our volunteers. If you would like to see volunteer opportunities with us click here to sign up! If you have already registered – click here to go to the myVolunteerPage. Volunteering your time is a great way to learn new skills, meet people and support the work at St Martin’s. BBC Radio 4 Christmas Appeal with St Martin-in-the-Fields relies on volunteers, not just at Christmas time but through out the year. If you are interested in supporting our work and contributing your time, please click here to register with us. We are seeking to increase the number of volunteers that support the Christmas Appeal and have several ways that people can help. Once you have registered we will email you when volunteer opportunities come along. These are some of the activities where we need help. 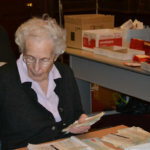 Since the very first Christmas Appeal volunteers from St Martin’s have opened post and processed gifts to the Appeal. This year we are looking for people to help out. We already have a team of dedicated people. Timings are flexible and people can do as much or as little as they feel able. Volunteers have taken calls from donors to the Appeal for many years. Recently we have worked with PwC to set up a volunteer call centre on Appeal Day (6 December 2015). And this year, volunteers will be taking phone calls throughout the period of the Appeal – from 6 December to 24 December 2015. The call centre will be ‘scaled’ to meet demand. On this the main Appeal Day approximately 100 people will answer calls, drawn from PwC, BBC Radio 4, St Martin’s and other organisations. On other days a smaller call centre will be established with between 3 and 12 operators. This will be located at St Martin-in-the-Fields. During December, the Christmas Appeal will present an exhibition in the Foyer at St Martin’s which highlights the work of The Connection and the Vicar’s Relief Fund. We need volunteers to host the exhibition. Visitors to the exhibition will be invited to participate in an activity. We will also have activity sheets or quizzes for people to do. We will also encourage people to make donations. A preparation and training event will be held during November. You might wish to volunteer to become a Local Champion for the Appeal. This involves encouraging as many people as possible to listen to the Radio Appeal and encouraging them to support it. We will ask you to play the Radio Appeal in your office, club or church or wherever you can gather people to listen or send the link to your friends and colleagues. We will have the videos for you to show people which we hope will inspire people to support us. We want you to help us tell as many people as we can! We are seeking to recruit a group of volunteers active in social media to support the Appeal from late November through to Christmas. These people will be encouraged to communicate as widely as possible about the Appeal using Facebook, Twitter etc.